Thanks Ryan Cunningham for making such an awesome review. 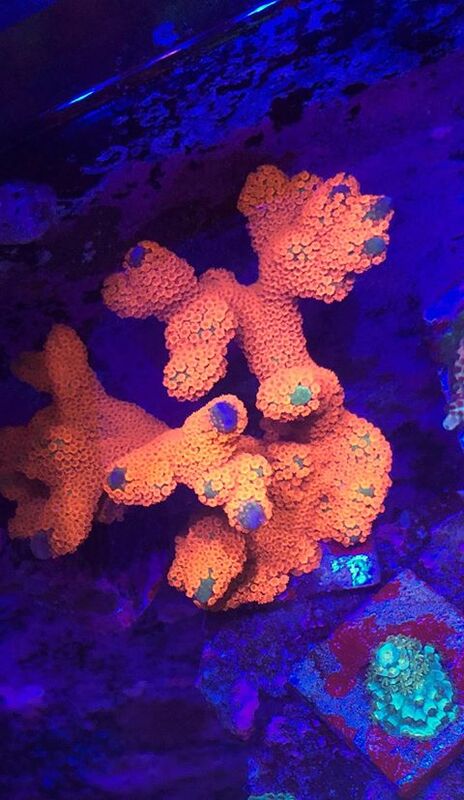 Hello my name is Ryan Cunningham and I am a coral addict. 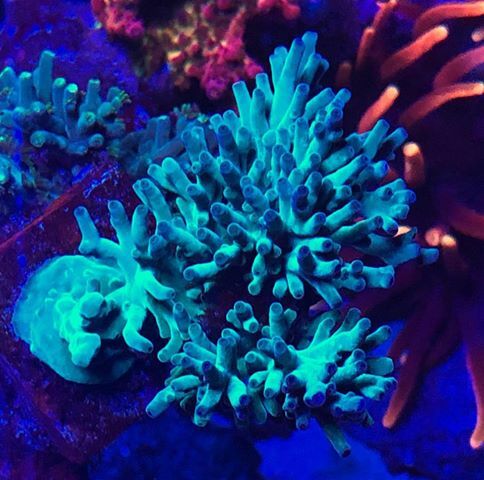 I started in the reefing hobby back in 2013 when a friend of mine from medical school introduced it to me on a series of spear fishing trips in Southern California. 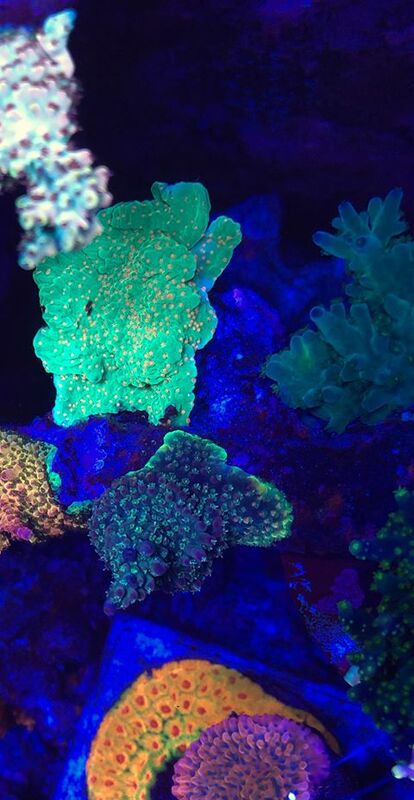 My first tank was a 40 breeder and I haven’t looked back since! 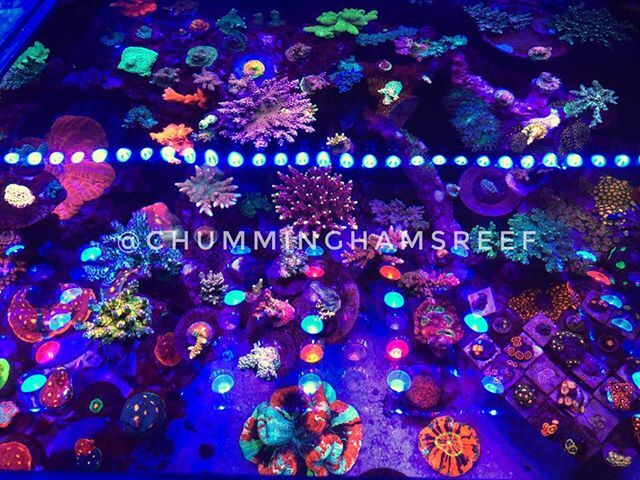 I love the reefing hobby and my undying excitement to look at it daily with hopes to find new growth wherever I look. 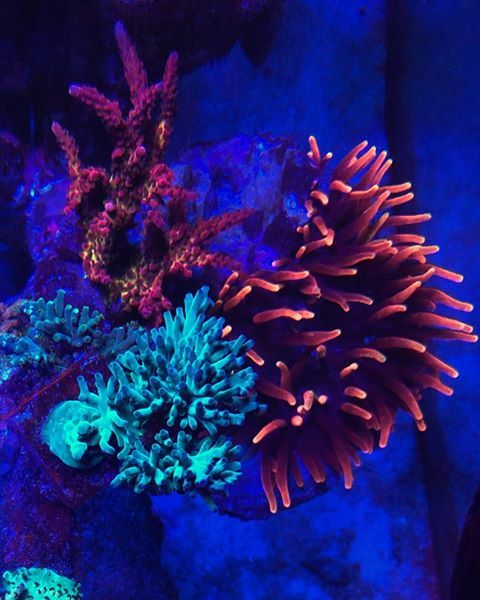 It always amazes me that everyday I come home and have an opportunity to look at my tank how I get the same feeling when rushing to the tank to see “how it’s doing”. 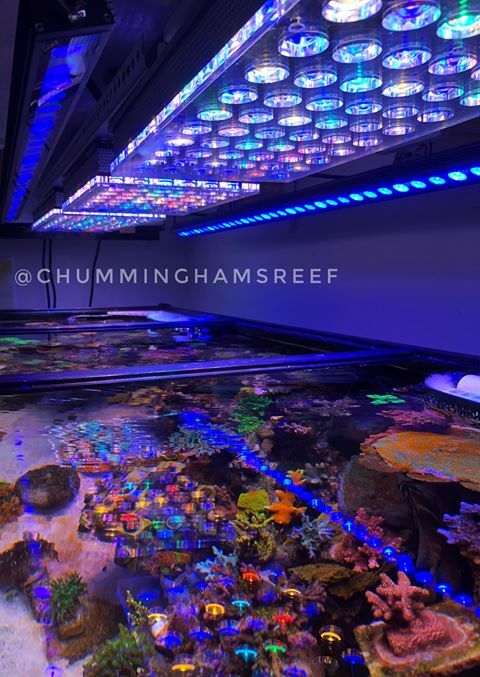 If you are a real reefer then you know the feeling of excitement we all get when rushing to see our tanks for the first time that day! 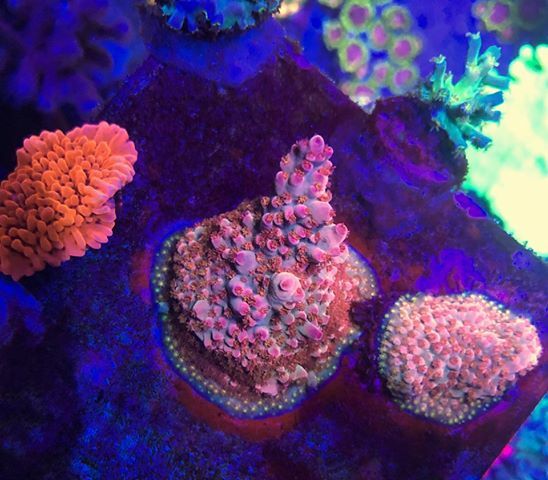 Now let’s talk about the guts and progression of my reef system. 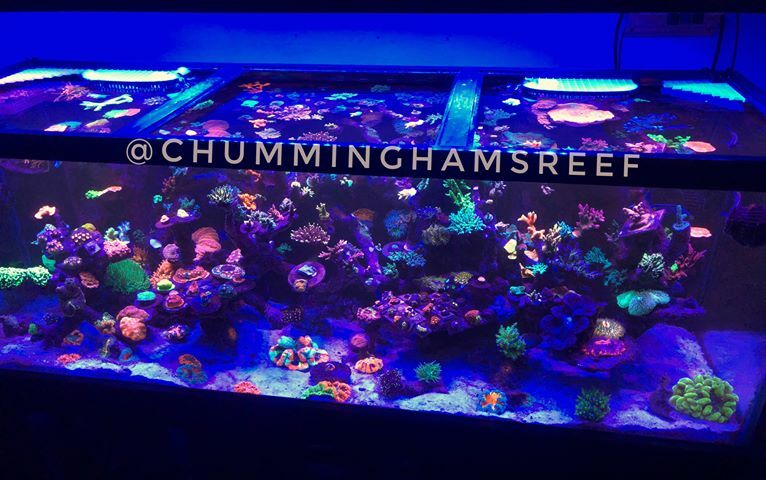 I run a very “simple” system although when you look at the sump area it does not always look that way! 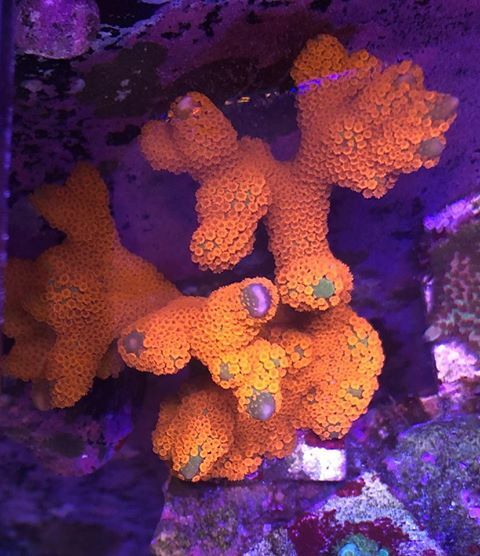 a bashea signature series sump, nyos 220 skimmer and am now lit by the most amazing lights on the market, Orpheks. I do not run any reactors, I do not run Gfo and I rarely use carbon unless I can justify a reason for its use and even then the bag is only in the tank for a maximum of 7 days. I dose a few different products including seachem fusion 2 part, 4ml of nopox, kalkwasser for a ph boost as well as a few trace elements from Red Sea. 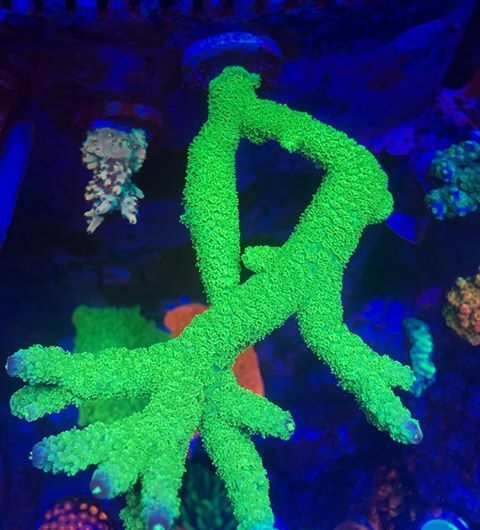 Everything is dosed by 2 Jebao dp4 dosers with possible plans to maybe switch over to Apex Dos system if their trident alkalinity monitoring is ever produced. now since this is really a review of how things have changed for me since switching to Orphek. Prior to running all Orphek lights I was running a hodgepodge of LEDs with two t5 retrofit kits. It wasn’t pretty but it most certainly got the job done. 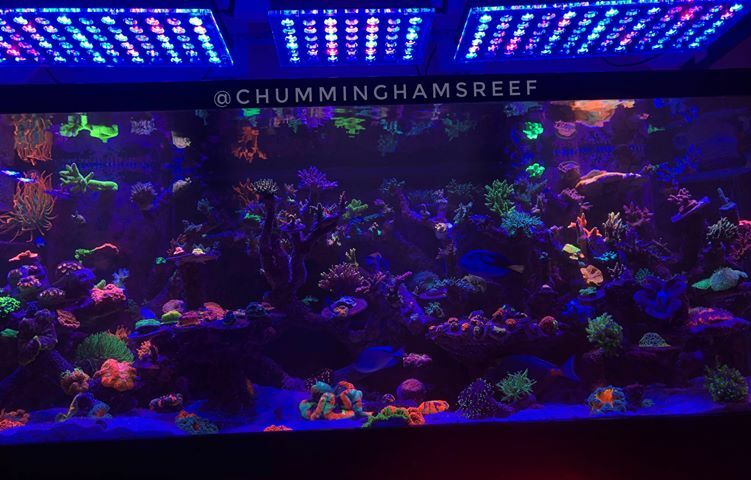 My main light was actually a 48 inch v1 reefbreeder. I loved this light and for the price and result that I got from it I think it honestly is the best “bargain” light on the market currently. However, if you are a reefing lifer like me and super serious about the hobby the switch to either Orphek or the radion g4 pro is inevitable. So why did I choose Orphek over radion? Well being a student into my late 30s was a big factor as I am pretty much constantly broke so financial reasons were one for me. From what I have been reading one Atlantic v4 covers the same amount of area as TWO radion g4 pros. But what tipped me over the edge to pulling the trigger? Well that was certainly the BRS YouTube review That Ryan and his team put together. 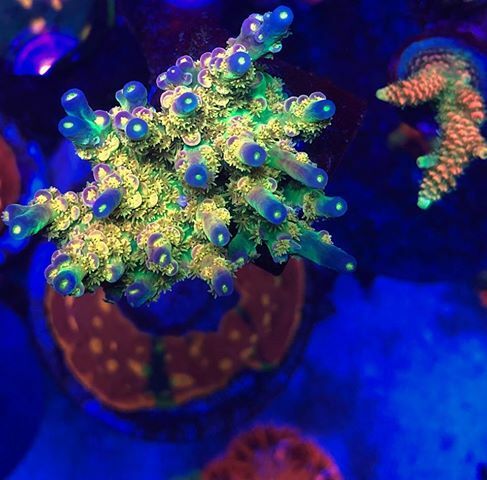 BRS does a review like this for all the lights they sell including Radions and when I saw that in that video Orpheks were not only outperforming radions but also outperforming their t5 geisman counterparts I was blown away. 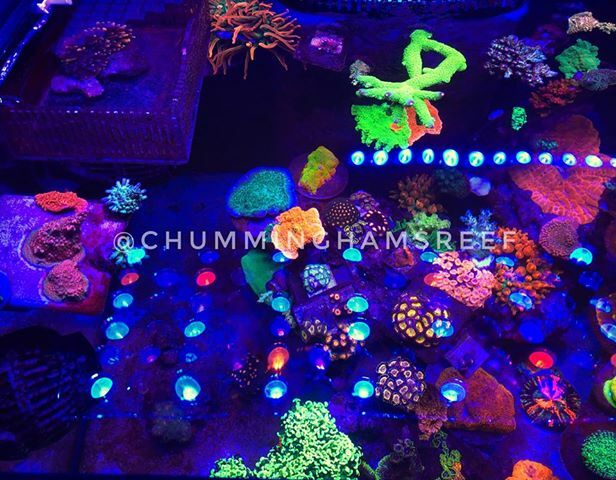 The light has even blending and spread throughout the tank and par readings that are just out of this world. For example, my par level 3 inches below the water is a blanket of 700 as measured by the apex par meter. This is kind of a good Segway into the next point I want to make about these lights. Clearly judging by the pictures I’m a huge stick head. 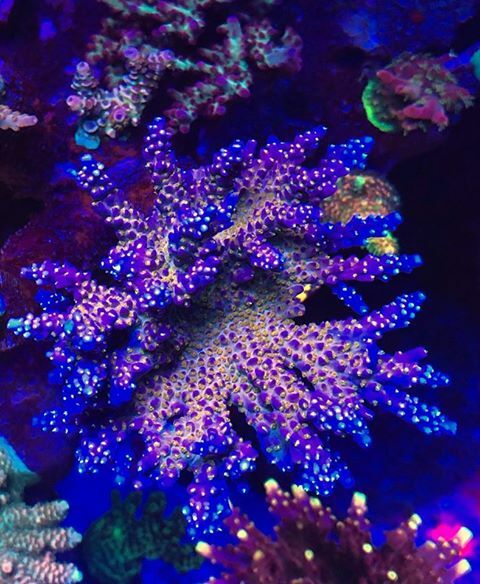 pretty much everyone in the Chicagoland reefing community knew about it and people were putting in their two cents. 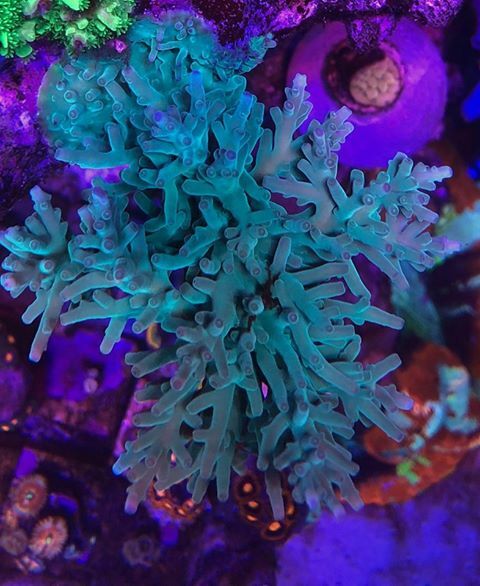 One fellow recommended that I monitor my alkalinity closely following the switch as the lights might “shock” my corals into senescence. Meanwhile my doser would still be adding alk and this could possibly lead to a crash. So I followed his excellent recommendation and I was monitoring alk on the daily making sure it stayed rock solid. Well after the lights had been installed for about two days I realized the opposite was occurring. My alk had dropped 1.5 dkh even though my doser was still dosing 60 ml of alk a day. 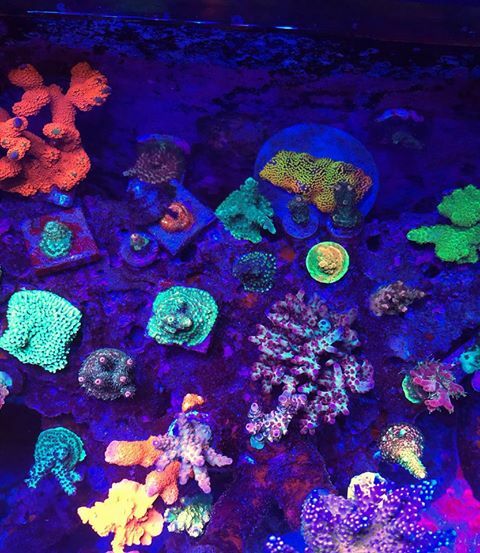 Well since that time I have had to increase my alk dose from about 60 ml a day (standard dosage under the reefbreeder led) to 100 ml a day!!! Yes that is a liter of alk every ten days and no I’m not switching to a ca reactor. 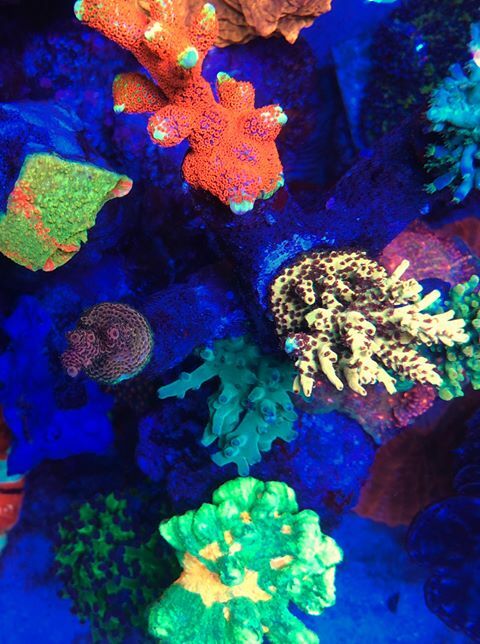 The increased dosage of alk can only mean one of two things, either increased growth of corals or increased precipitation of calcium carbonate into sand/sump. Well I’ll tell you it was the former and it was obvious to me that this was the case in just under a week. 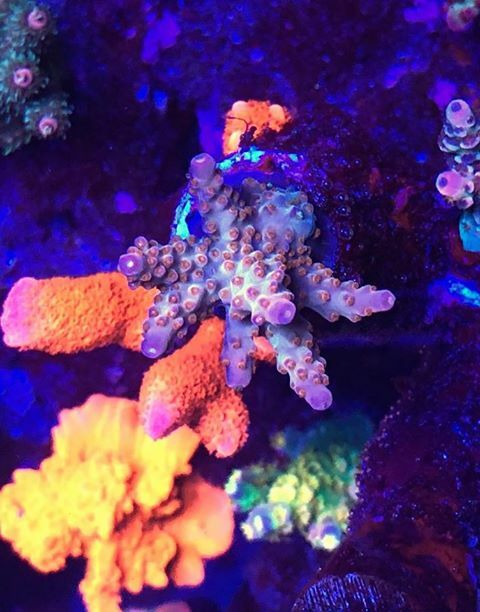 After about a week of the lights being installed I started noticing new INCREASED growth rates from all of my acros. It was not a subtle change, it was the most obvious change I have ever seen. 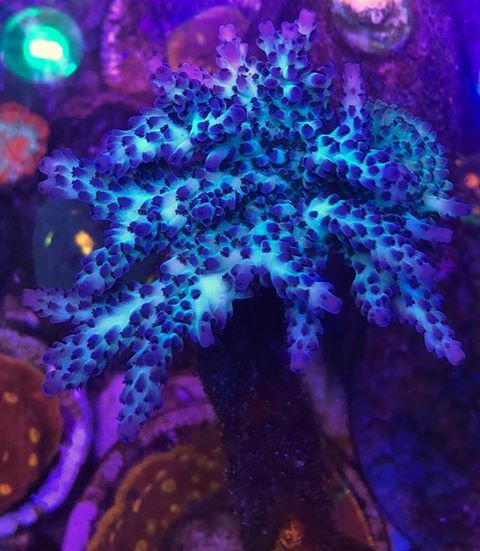 I have had some acros in here for four years where all they would do was encrust a little with no other changes all of a sudden just started to sprout little white growth tips ALL OVER the entire acro, it was incredible. This then prompted me to write one of two reviews I have ever written in my life. Basically what I am saying is it takes a lot for a guy like me to post pictures and write a full length passionate review about a product and honestly I just couldn’t hold back my excitement about the lights. 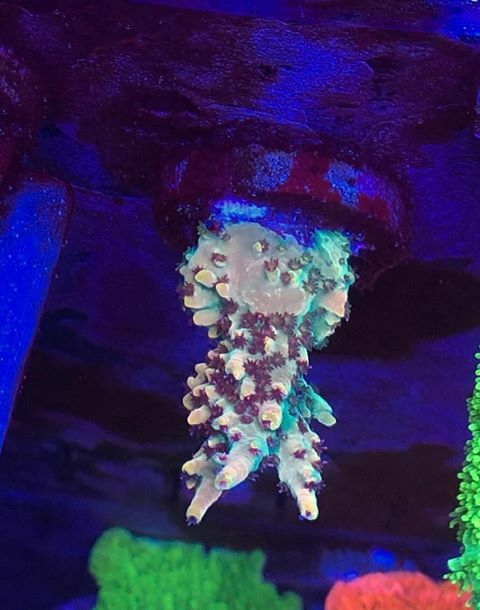 With the info ban in place I feel like is is crucial to make this hobby sustainable and I wanted to spread the good news to all the reefers out their hesitant about these lights to tell them these things are THE REAL DEAL. 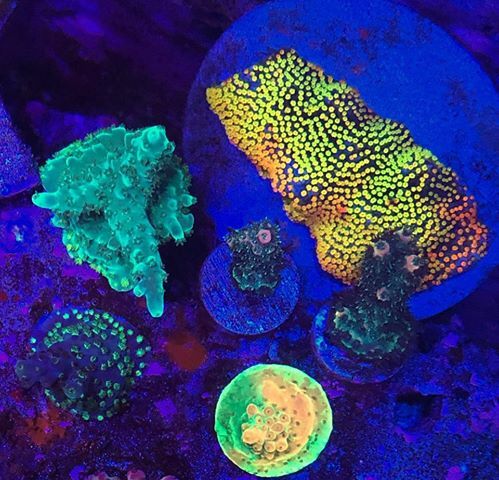 After having a few friends over they were all shocked to see what a difference the lights make in regard to the vivid colors I now see in not only my corals but also in my fish!! 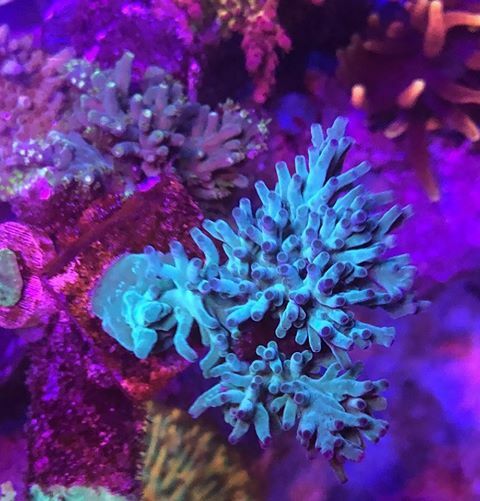 and my tank just looks so much more alive if you will. 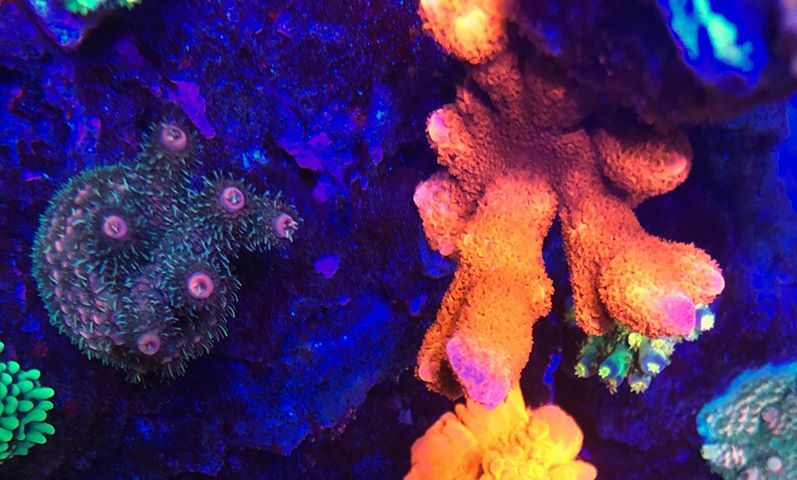 Since I like hard scientific facts that things are improving in my tank I would also like to share another unexpected positive of these lights, PH. Prior to adding these lights I was swinging between 7.8-8.1 which is not ideal imo. However after switching to these lights my ph has bumped up an average of .1. In other words since switching to these lights my swing is now 7.9-8.2!!! So what does that mean though? 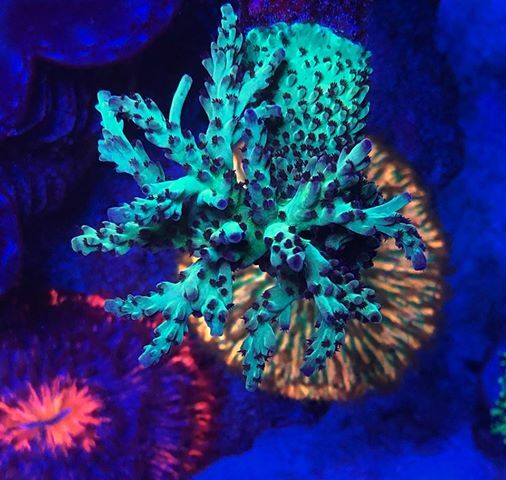 Well to me it indicates that the awesomeness of these lights have increased the photosynthetic capabilities of my zooxanthella. 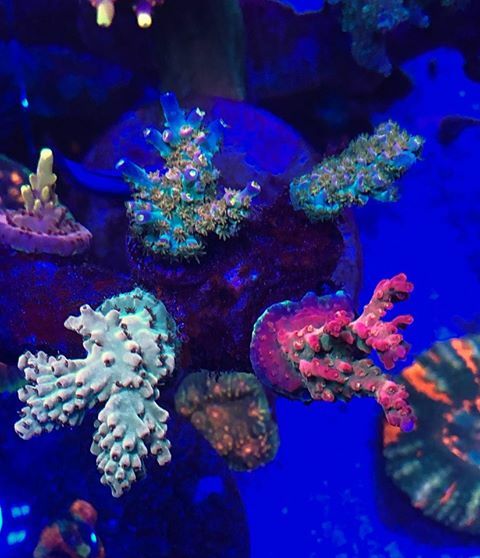 Since these lights have put these plant like cells into overdrive it has increased the conversion of co2 to o2 in my tank and therefore a increase in my ph. 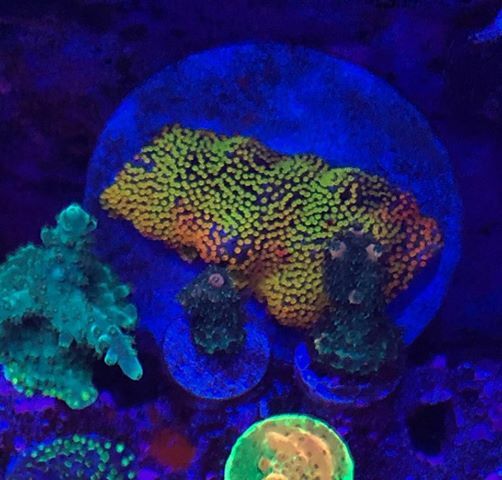 So people out there having problems with low ph, this is a possible piece to the puzzle for you in trying to get that number into a more acceptable range. 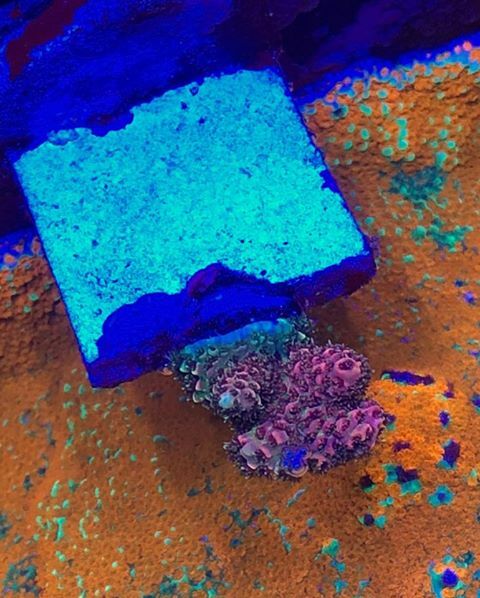 #science Lastly but most certainly not least piece of scientific evidence is the coloration and overall look of the coral. 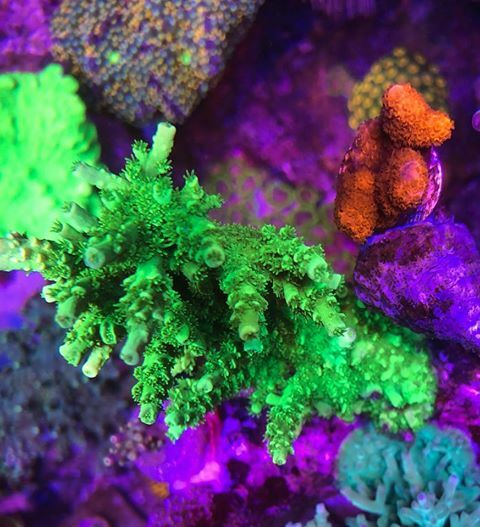 For me I will use the infamous but beautiful Vivids rainbow from my favorite coral shop Vivids aquarium. 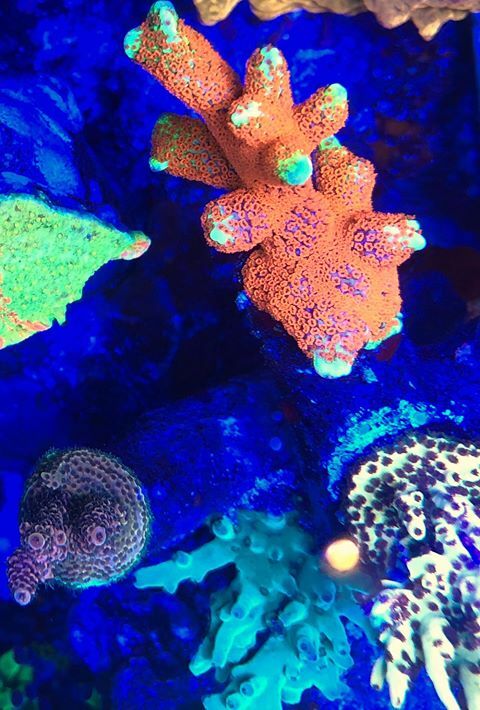 If you are a real stick head then you are familiar with this coral and how much of a pain in the a** it can be to keep colored up. 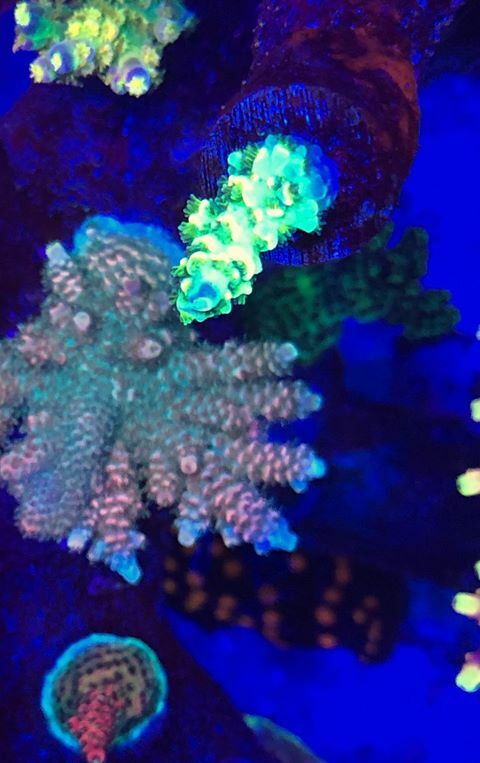 I have heard people say “if you even look at the vivids rainbow wrong it will brown out on you” and prior to owning these lights that was my experience with this coral. For me the vivids rainbow always grew but just looked brown and crappy. 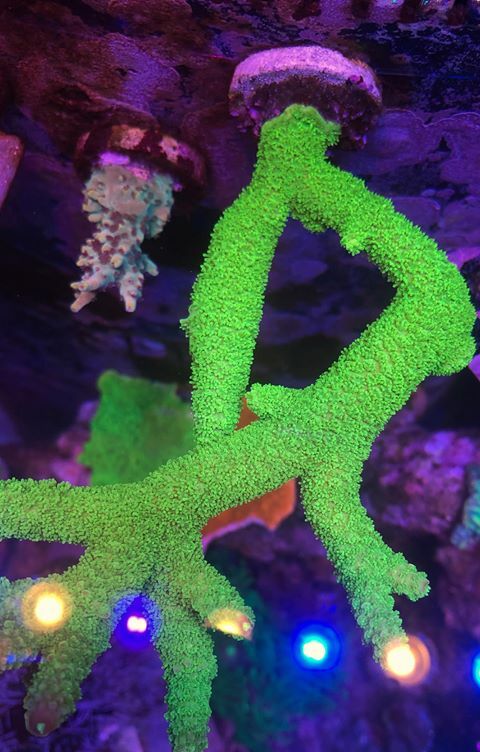 Since switching to these lights I have seen a transformation in this coral that is nothing short of shocking!!! The colors OMG THE COLORS MAN!!! 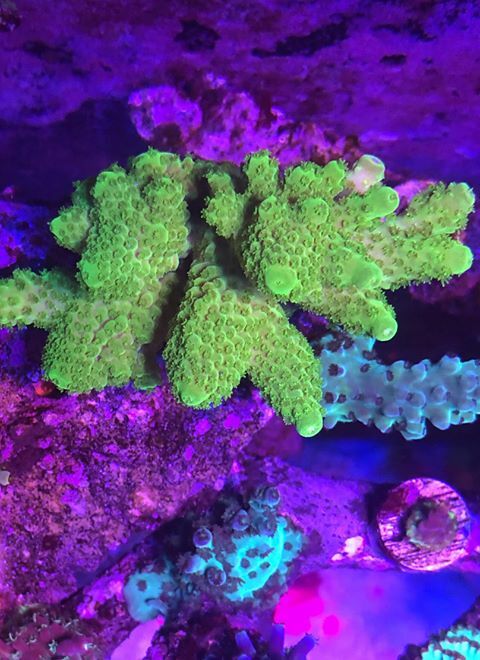 I have included a pic of my progression on this coral and Oh man it gets better everyday!!! 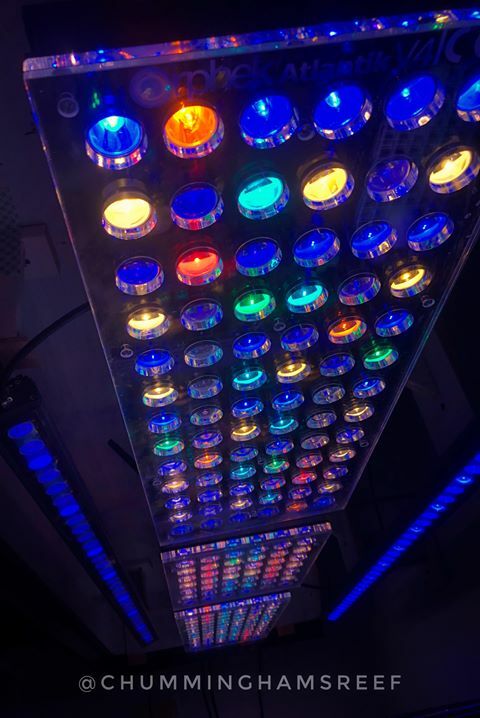 Thank you Orphek So after my initial unprompted review of the lights was made public on the orphek lighting homepage it was an honor to be contacted by the company to do another review on the lights and the changes I’ve seen a month out of installation. Well judging by the tone of this lengthy second review of the lights it should be pretty much obvious to any English reader that my love for these lights has just been growing and growing and growing. Do I have buyers remorse over these lights? HELL NO! If I had known I would have gotten the results Prior to purchasing these lights I would have gladly forked over double. 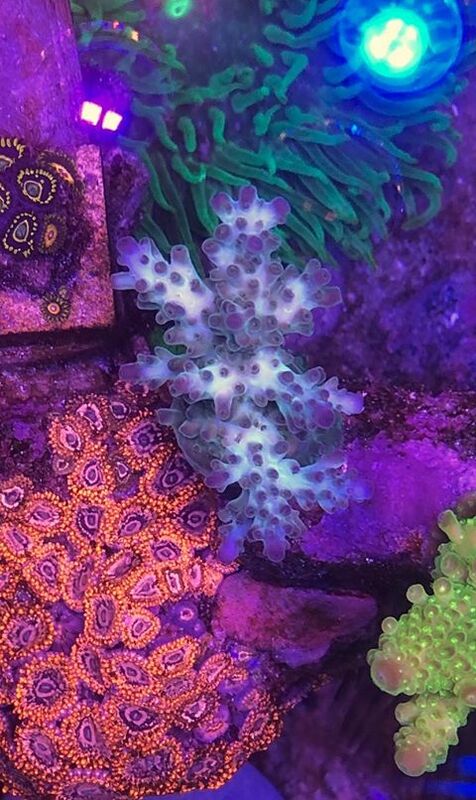 MY TANK IS LITERALLY ON FIRE NOW. 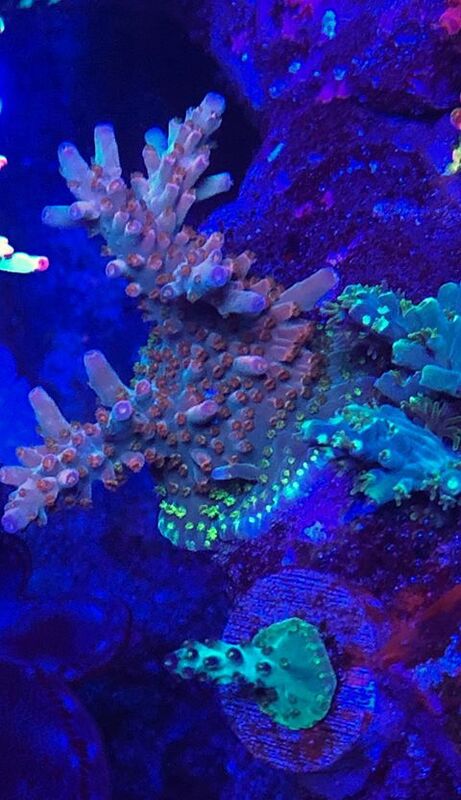 I’m pumping out so many Frags now that I can’t get rid of them fast enough locally anymore! I’m kind of out of things to say but I guess I will leave it like this, if you are uncertain about these lights, don’t be. 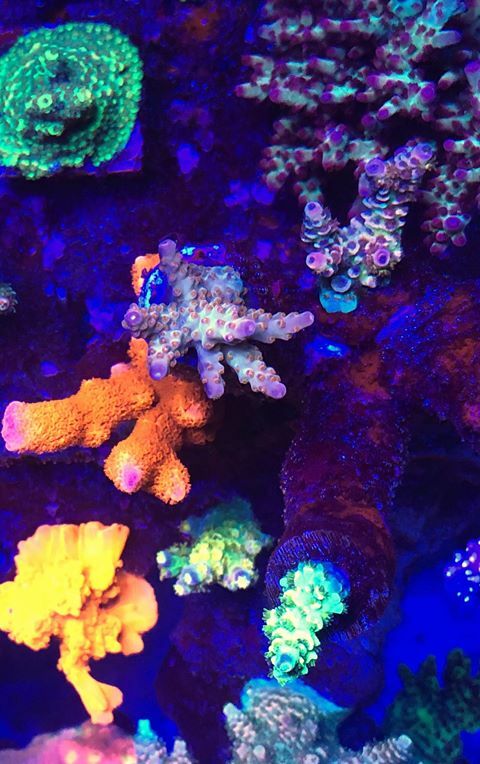 you will make in this hobby, pull the trigger, don’t look back and in a months time you will have more coral than you know what to do with!!! Thank you so much Orphek for making the best gosh dang lights on the market and making this dude right here the most satisfied customer on the face of the planet. 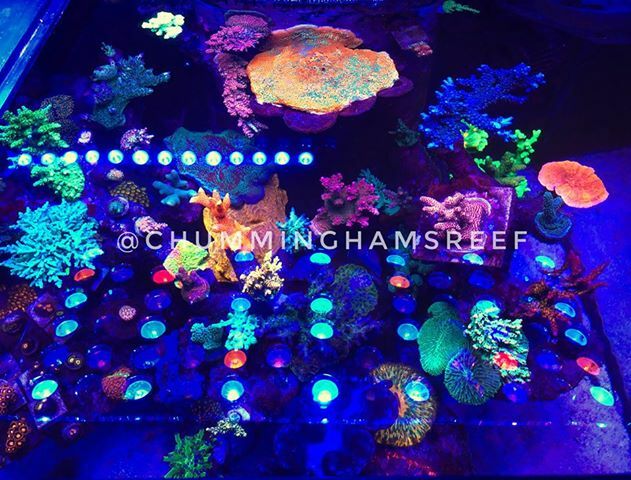 Thanks to Ryan who has sent us these beautiful coral pictures of his tank under Orphek lights!